The present material includes three letters. The first one is dated September 15, 1887. Judge is authorized by H.P.B. to show it to Elliott Coues, if he wants. The second letter, written in the same day, is Private to Judge. The third letter consists of a brief open message addressed to North-American theosophists, and its date is September 27, 1887. We reproduce these texts from “Theosophical History” magazine, volume V, Number 6, April 1995, pp. 204-207. The originals are part of the Blavatsky Letters collection in the Andover-Harvard Divinity School Library. As in previous letters, it is clear in these texts that H.P.B. was aware of the fact that the future of the theosophical movement would depend into a great extent upon the work done in the United States. History has shown her perception was right. After H.P.B.’s death, it was mainly in the U.S.A. that the original teachings were preserved. From that country they were promulgated again around the world in the 20th century; and this took place precisely on the basis of William Judge’s work. Although outer events did not turn out as envisioned by H.P.B. in the present correspondence, the general result was in accordance with the viewpoint expressed by her. In the above words, H.P.B. clearly implies that the preservation of theosophy, as a teaching, would depend on Judge’s work. She then refers to some of the difficulties her Monad would have to face in its next birth, should the theosophical movement abandon after her death the original teachings of theosophy. In a previous letter to Judge, H.P.B. had discussed the process of “blending” between part of a disciple’s consciousness and that of a nirmanakaya. Should the movement fail after H.P.B.’s death, in the next birth of her monad the new “individual” would have to remain for some time “assimilated to the nirmanakaya”, before being able to confront the actual vibrations resulting from the short term defeat of H.P.B.’s effort for mankind. Therefore H.P.B. foresees in this 1887 letter that she may have a “miserable death” in case the movement did not get to good and safe hands before she had to depart. At this point, the actual meaning of the words last incarnation and failure should be calmly investigated. No incarnation can be described as a failure or otherwise simply on the basis of its outward results in the world. The degree of success or failure of her incarnation as “HPB” could not be influenced, and much less determined, by the fact that her students would, or would not, preserve the occult link after her departure. The need to “keep the link unbroken” was most important, though, for the next incarnation of the same teacher. It was supposed that the same monad which worked as “H.P.B.” in the 19th century would come back soon. It would then have to face those same skandhas left by H.P.B. at the inner and vital substance of the movement. The teaching was septenary. It included several levels of skandhas which should be carefully preserved for future use. Such a link should be kept alive. The words “last incarnation” meant therefore HPB’s next incarnation, which she expected to be her last, before adeptship. H.P.B. probably needed no more than one lifetime before attaining liberation from the wheel of samsara. Judge probably knew what he was saying in the above lines. For him, the 19th century lifetime as “H.P.B.” would not be the last one of that monad, and the movement should be loyal to the original teaching until the same monad would return. Yet - why exactly did H.P.B. think there could be some sort of “failure” in the next incarnation of her Monad? She was an Initiate. She had a powerful experience, much good karma, and accumulated strength. The danger was in that, since for karmic reasons the reincarnation would take place in a short time, the soul could not easily face the tremendously powerful skandhas of its previous life. Such skandhas did not quite belong to “HPB”. They were created having H.P.B.’s body as a tool or vehicle. Those skandhas - and their karma of frontally challenging human organized ignorance - were the result of the Masters’ actions in cooperation with H.P.B., and were much too powerful to be successfully faced by her Monad in the following incarnation, without some sort of support. The skandhas and the karma involved would overwhelm the soul in question, at least for some time, if the movement would attach itself to illusions and fail to help the new individual. A direct outer help from Masters would be naturally out of the question since the time of their direct intervention was 1875-1900. Thus the groups and associations which remain loyal to the original teachings are and will be necessary to provide a basis for any true Initiate soul or Messenger who comes to the Movement. Such an individual must have an “umbrella”, a refuge from which to be able to face not only his own skandhas, but the skandhas of the movement, seen as a vehicle and tool for the dawning of a much stronger buddhi-manasic sub-principle in our mankind. The opening lines in the first of the following letters reveal an important aspect of the relationship between a master and a disciple, and indicate one of the reasons for the frequently long periods of silence on the part of a master, as recorded in various parts of the original teachings. In real theosophy, secrecy and dissimulation are not used for the purpose of personal benefit, or for the defense of outer institutions and bureaucratic corporations. They are acceptable, however, when strictly necessary for the defense of sacred truths or human life. The motive makes the difference with Karma Law, and theosophy is a philosophy of truth and self-sacrifice. The famous 1900 letter from a Master explained that misleading secrecy is a fatal mistake in theosophy and leads to destruction. While harmless dissimulation is permissible in outer aspects when necessary, truthfulness in the philosophical debate and utter sincerity as to the teaching is a rule with no exception. In the following texts, underlined words are thus in the original. Sometimes, they are underlined with a double line in the transcription made by Mr. Michael Gomes. We don’t take that into consideration. A word between square brackets is an attempt by the transcriber to understand the original handwriting. We add explanatory notes to the text. See “Letters Between Blavatsky and Judge-6”. “Faces of Friends”, an article dedicated to Isabel Cooper-Oakley at “The Path” magazine, July 1894 edition, p. 124. “The Closing Cycle”, a text in “Theosophical Articles”, by W. Q. Judge, Theosophy Company, Los Angeles, 1980, vol. II, p. 153. The same article is in the book “The Heart Doctrine”, W.Q. Judge, Theosophy Co., Bombay, India, 1977, p. 40. “Theosophical Articles”, H. P. Blavatsky, Theosophy Co., Los Angeles, 1981, three volumes, volume I, p. 120. See also the book “H. P. Blavatsky, a Great Betrayal”, by Alice Cleather, Thacker, Spink & Co., Calcutta, India, 1922, 96 pp., p. 2. Another possibility is that the rebirth of such a Monad would be postponed for another century or two, until the movement could be ready and karmically deserve further teachings. 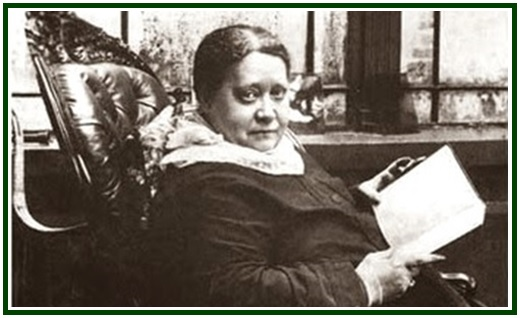 “HPB - The Extraordinary Life and Influence of Helena Blavatsky, Founder of the Modern Theosophical Movement”, Sylvia Cranston, a Jeremy P. Tarcher / Putnam Book, published by G.P. Putnam’s Sons, New York, Copyright 1993, 648 pp., see p. 322. H.P.B. spells the word “Maycot”, with one “t”, Cranston uses “Maycott” with two “tt”. Either I meddled up things writing one thing & thinking another or you misunderstood me. Master has suggested, as you say, not ordered (for He “orders” no longer since the unveiling of every prominent theosophist’s character has commenced) - & therefore ordered (me alone) to telegraph to you both  & ask you are you ready, or willing, or prepared to be elected for life. This does not mean that you should be elected right away & to begin with. The change of front would be too ludicrous & absurd. But it means just what I telegraphed to you. Begin by being elected both of you for a year, and then if you are prepared to pledge yourselves both for life - then affairs & events may be turned off by unseen powers into such a groove that you will be unanimously elected for life - just as Olcott & I were - to go on with the work after our deaths. Do you understand what it means? It means that unless you consent, you will force me to a miserable life & a miserable death with the idea preying on my mind that there is an end of theosophy. That for several years I will not be able to help it on & stir its course, because I will have to act in a body which will have to be assimilated to the nirmanakaya; because even in Occultism there are such things as a failure, & a retardment, and a misfit. But you don’t understand me, I see. Judge, try to. Whatever you do hurry up, for you do not know what may come tomorrow. Nor do you know to read peoples’ characters yet, behind a thick veil of maya. Those you have an affection for, you will skip over their faults; those you have no love for, you exaggerate their defects. It is only human & natural, my dear friend, but it is not theosophical. “Lucifer”  is sent to you; I do not like, or rather I am not so well satisfied with the first no. I have tried to make it entirely different from the Path & Theosophist, so as not to clash or hurt either, and now the actual thing itself jars upon me. Go to India until the English put me out? Until the English put me in you mean. For this is what will happen if I go. C.O. is sure to side with the padris, and a lie against me is no sooner told than it is believed. Thanks. I believe I am more useful here, in London free, than at Adyar in prison as a Russian spy - on suspicion. Do as you like. Do not ask my advice any more for really I am ready to do anything you tell me, but I will advise you nothing. Let Karma take its course. The letter just written you may or might show to C. , therefore, I have written nothing there that would prevent you to do so. But what I say there is gospel. Master wants you to be elected for life, for reasons of his own, that’s god’s truth. I cannot write to C. that it was a test since it was not, but simply a question to which both of you answered. I am ready to say any fib on lay principles, but I cannot say a lie when Master is concerned. You say you do “feel Master” in this. Well my dear fellow your intuition is at fault then. Less than you would I want to see him or anyone else (save yourself) elected for life, but once it is in the programme for future action & policy, I have but to submit, disagreeable though it be for me personally. But if I do not like the idea, it is because I trust no one any longer, save yourself & Olcott, perhaps. I have lost my last faith in mankind & see & smell (rightly, if you please) Judases everywhere. But with you it is different. You do not want him elected for life because you exaggerate his evil tendencies; you dread his lying propensities, his “tricks” & vindictiveness. Well, you are right only as far as the latter vice goes. He is vindictive because he is proud, & if you make of him an enemy now - you will have murdered theosophy in the U.S. with your own hands. Vindictive he is, lying & tricky no. You do not know him. He is a sensitive & a terrible one. He is more than a medium, for he deceives not only his “sitters” & public but himself - which other mediums do not. He is a self-hypnotic to the last degree. He is that so much so, that while some of his “tricks” are apparent to you, they are truth & fact for him. He is what Mahomet was, yet Mahomet founded a religion which with all its faults is a 1000 times better than any except Buddhism. What matters it to you his Karma if he obtains or creates good results for theosophy? Coues is our last trump-card. If you lose him you & the Cause will have lost their battle. I tell you so. It is our Waterloo. Olcott is too weak though firm in appearance. The whole plan that “upset” you, the “plan for life” is a consequence of his getting married to Mrs. Bates. That woman is an angel, & my best friend among the she-females. She will be his salvation. The man is profoundly miserable in his hurt pride, & because people have never understood him rightly. He hates & despises the world, because it pelted him with mud for 20 years when he had not deserved it. He has of the traditional “fallen angel” in him & I repeat again - Judge, you do not understand the man. Let him be elected for a year & then - see. But whatever you do for mercy sake, for the sake of [the] Masters, your own and the sake of the Cause, do not become enemies again. I feel profoundly desperate & miserable and you made me so. I had no thought of the thing; I had given up all idea when I heard that a political entente was going on between you two. I was warned. Then came your joint letters from Washington. Then Master ordered me to telegraph, I did, as told & now it upsets you!! My dearest friend you cannot make a theosophist according to your heart of him. But you can make an excellent weapon, a charmed “Thor’s hammer” with which you may become Thor the invincible against the “Frost giants” of the malicious, wicked materialistic world. We must either do the best we can out of available material at hand or - shut up shop at once. Amen. And now may the Masters enlighten you. The Convention held April 1887, in the United States having left open the appointment or office of President - by order of the Secret Council of the Holy Brotherhood which appointed me & conferred upon me my original powers as Founder of the Society, I do hereby, in virtue of those powers appoint Dr. Elliot Coues, President of the Gnostic Theosophical Society, Washington, D.C. to be President of the American Theosophical Council from this date until the next regular convention & direct my Co-founder, W.Q. Judge, General Secretary in America to notify all Branches of this appointment. The President will uphold & carry out the present Constitution of April 1887. “you both”- that is, William Judge and Elliot Coues. “Lucifer” magazine, whose first number appeared with the date of September 15, 1887. The word “Lucifer” means “light-bringer”. It is an ancient name for the planet Venus, the “morning star”. Since the Middle Ages, the word has been distorted by Catholic priests. Thus ends the first letter. The next word is written in another sheet of paper. H.P.B. worked with complete truthfulness, while trying to defend truth from treason. By a natural projection mechanism she “expected too much from people” - and got disappointed. Her nervous system was adapted to work in high levels of direct perception and sincerity. She experienced great suffering while seeing the reality behind the masks often used by people in social life. Such a contrast was part of her own training as a disciple. Disappointment brought a lesson in detachment and stimulated a better understanding of the concept of Maya. - The signature with such a triangle means that H.P.B. sends the letter in her official capacity as an initiated disciple, or “by orders” of her Master, or with his approval. It can also imply a combination of these three factors.